Description: Abu Dhabi – Landscape Architecture, Urban Design analysis and existing infrastructure integration plan into a 4.5 kilometer linear greenway in the heart of Abu Dhabi. 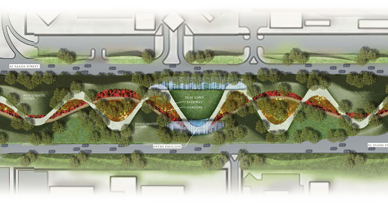 The study integrated existing and proposed public transit systems along with the addition of a public circulation and park system with alternative energy art ‘nodes’ that would self sustain the entire linear park off the grid. The concept utilized the natural sculptural forms of the dune landscape as the primary vertical separation of spaces. Specifically ‘Star Dunes’, which are large pyramidal or star-shaped dunes with three or more sinuous radiating ridges from a central peak of sand. This dune has 3 or more faces and are produced from a variety of wind directions. Star dunes do not migrate along the ground, but rather grows vertically. Because the root of much of the cultural patterning that occurs in the Middle East was based on mathematical equations, the circulation patterns also took a cultural direction and inter-played with the visual mathematical form of the sine wave. Two ‘sine’ waves were formed and weaved through the Star dunes to complete the geometry and design. The design also integrated a sustainable planting strategy involving minimizing turf (less water use – irrigation, reduce carbon dioxide from maintenance equipment) and use/re-use of drought tolerant, native plantings. As a result of the dunes and sine wave geometry, large pockets of solar arrays were also a key part of the sustainable strategy, with hopes of generating enough energy to be self sustaining.